June has always been my favourite month. When you’re a rural kid in elementary school, June is the best month of the year. Not only is it now light enough to play outside after school, it is no longer dark when it’s time to get up in the morning. In June, teachers seem to have given up on getting much of anything done and there are full days of scheduled outdoor fun. June is also the month when the world turns such a deep and vibrant hue it feels as though you can taste and smell the colour green. The wild strawberries begin to bear their tiny, intensely flavoured berries, and if conditions are just right you may find enough for strawberry vanilla muffins. The wild roses are also in bloom, filling the air with their delightful fragrance, and it is now warm enough to go camping comfortably again. And did I mention that it doesn’t get dark now for ages? On top of all these wonderful attributes of June, there is also the wonder of summer Solstice. Solstice is my celebration (it also occurs two days after my birthday and so holds special meaning for me for this reason as well). It is the one party of the year that I always host at my home. There are of course many other solstice parties around, but Solstice for me will always happen wherever I am. Since the beginning, Solstice has always been an important marker of time on the farm. All spring we were hurrying and scurrying around trying to get everything seeded or started, get all the beds made and weeded and seeded and transplanted and watered… Every day feels like a scramble no matter how prepared we thought we were prior to the start of spring, and we would fall into bed exhausted each night. (Did I mention how ridiculously long the days are leading up to Solstice?) In May the Farmers’ Market would also begin, and so while still planting and caring for seedlings and building compost and setting up the irrigation, we would also now have two full days devoted to harvest and market. Solstice is what we were working towards. Many long exhausting days, I would find myself thinking, “It’s okay, there are only __ days until solstice.” It was both our deadline and our reward. Other times I would think, “It’s okay, there are still __ days until solstice.” At times Solstice loomed ominously on the horizon and we felt the pressure of all we had to have done by that date. We anticipated and dreaded it sometimes in equal measure. It always felt as though once Solstice arrived we would no longer be so busy, but this wasn’t really true. It’s not that we were less busy after Solstice, only that the tasks and we ourselves would have changed by the time we got there. On the farm after Solstice you begin to reap what you sow, both literally and figuratively. Save for a few succession plantings and the garlic, nothing more gets planted after Solstice. Everything is in the ground now, or at least we hope it is because with the short seasons we always experienced at Road’s End Farm, we won’t get a chance to harvest it before it is claimed by the frosts of fall. If, by the time Solstice rolls around, the irrigation isn’t set up, we know we will be in trouble, scrambling to lay out drip line between plants (never an easy task) while still watering by hand. If the weeds are not in some semblance of order by this time, chances are we will never catch up with them this season. As well, we certainly better have finished building a decent compost pile for the fall! Every day the countdown, but also the anticipation. Solstice is fun! Even though planning now takes some of the last remaining moments in the evening for making costumes and planning decorations, and gathering recipes, there is a sense of excitement to it, and not only are we trying to get everything in order so that the season will run smoothly, but there is the added incentive of wanting to be able to show a beautiful garden to all of our friends. It is a time to celebrate. We work so hard as Nature comes alive again after her winter’s slumber. Now we pause and congratulate one another on a job well done. By this time, rather than exhaustion we feel jubilation. Our bodies have acclimatized to physical labour again, and to being outdoors all day, and with the increase in light so too has our energy increased. On top of that, we have become tanned and lean and strong and healthier and happier. It’s not just us either, everywhere you turn, things are fertile and lush. Everything seems to be blooming and pollinating and singing and birthing and everything seems to have more energy. A celebration renews our spirits even more. Good friends, good food, good music, and good laughs help us to recharge before summer begins in earnest. 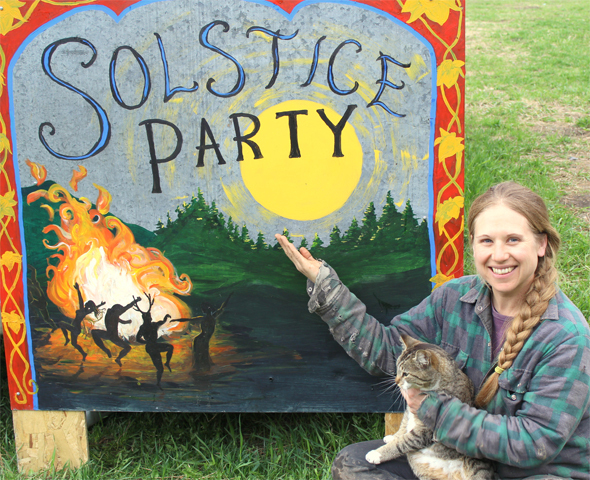 On Solstice we stay up all night singing, dancing, and playing music around the fire. Just as at Winter Solstice we celebrate the returning of the light, at Summer Solstice we feel a bit of relief and are in fact celebrating not only the longest day/shortest night of the year, but also the knowledge that the dark is returning. The days will decrease in length now for the next six months and we can celebrate how hard we have worked while hopefully now anticipating successively shorter workdays. When you live with the seasons, which anyone who works outside most of the time does, real markers of time, related to the length of days and the warmth of the soil and the weather, are important moments to pause, take stock, celebrate, and prepare to move forward into the next stage. Terri Smith is a non-certified organic vegetable farmer in the Cariboo. She is passionate about writing, art, goats, and feeding good food to good people. She believes in following your heart, living your dreams, and taking care of the planet. TheGreenGazette focuses on global environmental challenges, ecology, agriculture, country living, local communities, green technology, natural medicine, health and wellness, arts and culture, and green solutions. Located in the Cariboo Region of British Columbia. In print: Over 10,000 readers in the Cariboo Chilcotin area including Williams Lake, 100 Mile House, Quesnel, Prince George, Bella Coola, Horsefly, Lac La Hache, and select locations along the Fraser Canyon and Northwest BC.